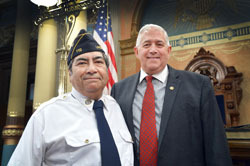 LANSING, Mich. — State Sen. Ken Horn, R-Frankenmuth, welcomed Jesús Lozano, Petty Officer 3rd Class and Commander of the Linden American Legion Post 119, to the Michigan Capitol for the Michigan Senate’s 23rd Annual Memorial Day Service on Thursday. Lozano was an aviation electronics technician during the Vietnam Era and served in North Atlantic. He also serves as the Sergeant of Arms for American Legion District 6 and was joined by his wife Pat at Thursday’s ceremony. 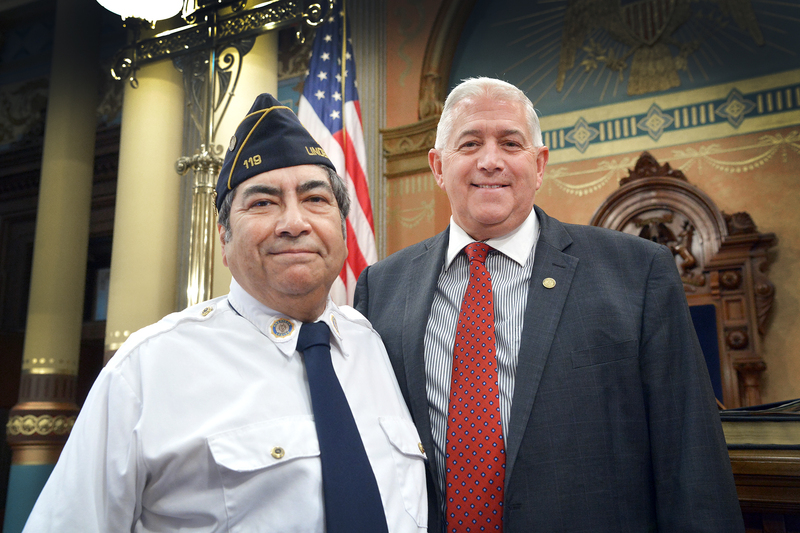 PHOTO CAPTION: State Sen. Ken Horn, R-Frankenmuth, stands for a photo on the Senate floor with Petty Officer 3rd Class Jesús Lozano, his guest at the Michigan Senate’s 23rd Annual Memorial Day Service.